Please Sign In. New Users, Please Enter Contact Info. YOUR SECURITY and CONFIDENTIALITY are major concerns. If you think you’ve identified a match, we’ll provide the closest pet shelter to make a prudent exchange. If you do request to share contact information, then we’ll honor your wishes. Your personal information will never be shared with any outside organization. Please skip to NEW USER REGISTRATION (next section below) if you've never posted or registered a critter. By clicking the Sign In button, you agree to the terms of our User Agreement. Please enter your contact information in the section below to REGISTER. Information will remain confidential. If you request to share contact information with someone who lost or found a critter, then we'll honor your wishes. Share contact info with finder of your lost critter. 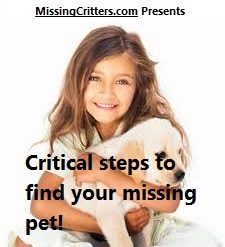 © 2019 MissingCritters.com. All Rights Reserved.